CAPE CORAL, Fla. (July 25, 2010) - He may not be a magician, but he can make a whole city block disappear. There are no rabbits, puffs of smoke or tuxedos in his line of work - just excavators, dump trucks and blue-collar guys in jeans and work boots. David Mulicka, head of Honc (pronounced "honch") Destruction, said the business of making things disappear has been good lately. 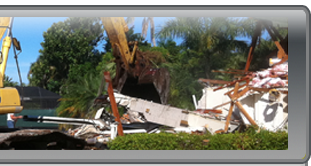 The Cape Coral-based demolition company, which Mulicka says is the largest of its kind in Southwest Florida, handled a record number of demolitions last year - 205. That's up from 91 in 2008 and 17 in its first year of business in 2003. Despite the down economy, total sales for the company last year were $1.63 million, a big jump from the $941,000 in 2008. Last week, the company wrapped up a job tearing down its first elementary school, Meadow Park Elementary in Port Charlotte. The 92,000-square-foot project took about three weeks. It was also the company's first LEED certified demolition, meaning 75 percent of all materials had to be recycled. While the certification entailed a lot more paperwork, Mulicka said knocking down walls is still a good way to relieve stress. "All of us have fun with demolition; it's a fun business," he said. With the company's success, there may be a little less stress to relieve lately, though. So far in 2010, the company, which has 34 employees, has won the bid on 27 of 68 projects in Lee County for a market share of 42 percent. That's up from a 27 percent share in 2007. Among those jobs are everything from $1,000 couple-hour affairs to $600,000 several-month tear-downs. The tallest building Honc has toppled is the old four-story Fort Myers Exhibition Hall in downtown Fort Myers. The most buildings it has demolished in one job is 75, a project involving duplex homes at Tyndall Air Force Base near Panama City. That was one of his favorite jobs, Mulicka said. F-18 and F-22 fighter jets were flying overhead as the crew worked, and every day at 5 p.m. operations on the base came to a halt as the national anthem was played. "That job made you feel very proud and patriotic," he said. Some of the most memorable moments, though, have come at the hands of housewives. Occasionally, Mulicka lets the owners of a property sit in the excavator and take the first swipe at a house they're tearing down to build their own home. "If you see a housewife on a 70,000-pound excavator crunching in the roof of a house - the smile on their face - those are some pretty neat memories." Other jobs, especially those involving condemned houses, can be crapshoots. Often abandoned, the properties may have housed vagrants or drug addicts and had no working plumbing for years. "It can be very unpleasant," he said. But even if the homes are in good shape, there are still surprises. Once, a man stopped the wrecking crew because he neglected to remove one important item. "He came back as we were just starting to crunch the house and asked me to go up in the attic and hand him his father's ashes," he said. The company - an offshoot of Honc Marine, which works with seawalls - has a few mottos, he said. "We can destroy anything," is one of them. "Do what you say and do it on time," is another. The latter is one of the reasons the company is growing even as many companies are scaling back, Mulicka said. 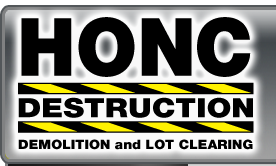 Don Koogler, owner of Koogler Homes, has worked with Honc Destruction and Honc Marine on 20 or so projects and thinks the motto fits. "They make sure you're satisfied and, if you're not, they go out of their way to make sure you are the next day," he said. Mulicka said he tries hard to maintain the company's focus. "For you to survive in today's economy, you have to find something you're the best at," he said. "A lot of people try to be all things to all people."